If my skin could talk, you would’ve heard, “Ahhmaazing…” in rapture the first time I tried Dr Sheth’s range of skincare products specially formulated for the Indian skin. If you’re regular reader of my blog you know how knee deep I’m into skincare and how much I adore French skincare and Kaya skin clinic products simply because of their efficiency and effectiveness. I like products that are scientifically formulated and deliver on their promises. 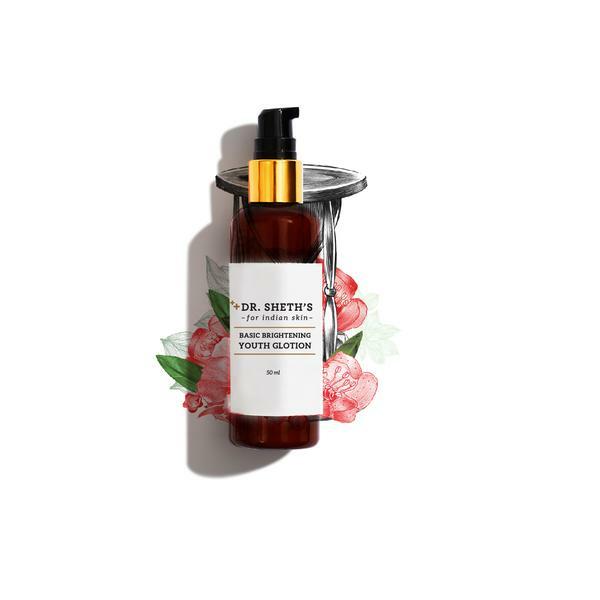 Unfortunately, despite a flood of products and plethora of skincare brands in the market, there are very few, in fact only a handful, which actually come out fair on their claims. 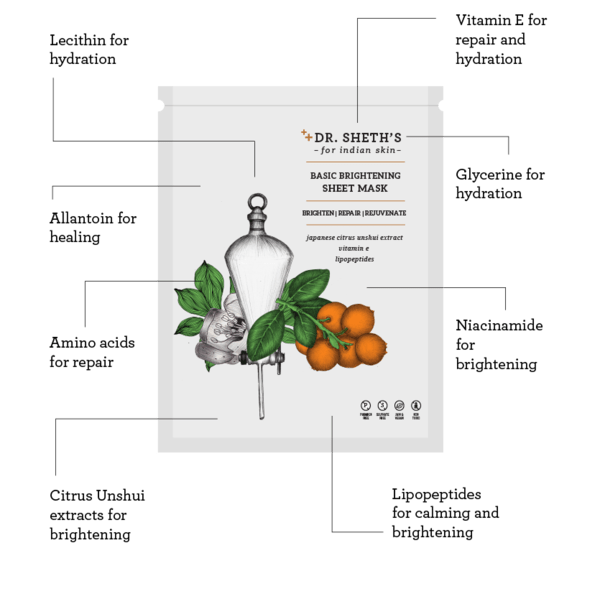 So when I heard about Dr Sheth’s line of luxury skincare products that are especially suited for the Indian skin and are designed by one of India’s first cosmetic dermatologist, Dr Rekha Sheth, I got super excited. After all, who else can understand our skin needs better than a dermat herself! No wonder, the ingredient list is pretty awesome. You name it and they have it! The ingredient list contains all the miracle actives like Vitamin C, Vitamin A, Kojic acid, Hyaluronic acid, Niacinamide etc. in impressive quantities. As Indian skin is more sensitive to pigmentation and blemish issues due to the harsh environment we live in – UV rays, pollution, dust and our genetic disposition, the higher quantities of skincare actives ensure that we flaunt flawless, radiant skin year round. Minimalist, attractive and travel friendly. Products come in simple brown-coloured plastic bottles with attractive golden lids. How’s the pricing and availability? The brand describes itself as luxury skincare line with their products ranging from INR 375 to INR 2,250. As most of their best selling products fall between the price range of INR 375 to INR 950, I personally feel the products are accessible, affordable and given their impressive ingredient list, they are worth every penny. “Dr. Sheth’s Basic Brightening Youth Glotion is a brightening lotion formulated for Indian skin. It is the only product in the Indian market that combines a high dose of niacinamide along with hibiscus extracts, citrus unshui extracts and orange oil for a super brightening effect. The Vitamin B3 content in the lotion is an all-rounder that works against inflammation, acne, pigmentation, tanning and aging to ensure an even clean skin tone. This brightening lotion keeps Indian skin from getting inflamed, excessively oily and damaged. What does the product contains? Water, Propylene Glycol (Penetration/Texture Enhancer), White Soft Paraffin (Emollient), Niacinamide (Anti-Pigmentation, Anti-Acne, Anti-Redness), Light Liquid Paraffin (Moisturizer), Cetomacrogol (Emulsifier), Cetyl Alcohol (Emollient), Japanese Citrus Extract (Brightening), Allantoin (Healing), Glycerin (Hydration), Phenoxyethanol (Preservative), Stearyl Alcohol (Emollient), Orange Oil (Brightening), Hibiscus Extract (Anti-Scar), Perfume. Possibly acne or allergy causing any ingredient? After cleansing, take a small amount and apply on the face in upward movements. For the body, take a small amount and apply to concerned body parts. So, basically it’s a brightening moisturizer loaded with the goodness of vitamins and youth giving actives like Vitamin C and Niacinamide. It’s quite thin and light weight in consistency but however, works and feels a lot like balm on dull, tired skin. It’s extremely hydrating and nourishing to the skin. While, I was a little apprehensive about the presence of liquid paraffin in its list of ingredients but thankfully it hasn’t triggered any break-outs yet! Though, I should point out that it could get a little greasy for extremely oily or acne prone skin. So oily skinned gals, use your caution using this lotion in hot humid weather or better save this moisturizer for winter, when your skin naturally feels on the drier side. But what I love the most about this product is – the scent – smells of green apples and lilies, which I simply adore! I use this after washing and toning my face. It moisturizes and brightens my skin just so perfectly. Presence of liquid paraffin in ingredient list makes it a little disappointing. Also, the product is a bit greasy so it may not suit oily or acne prone skin. Remove from pack and place on face for 15-20 mins. Once done, discard the mask. I’m a big fan of sheet masks – they are easy to use, non-messy, and super travel friendly. Dr Sheth’s basic brightening sheet mask contains peptides, niacinamide and anti-oxidants for hydrating, nourishing and strengthening your skin tone. I have loved and used many sheet masks before, but this is the first one with niacinamide. Niacinamide is a wonder ingredient for skin. From brightening dull skin to refining the appearance of enlarged pores and fine lines, it has multiple benefits for the skin. Sure, it’s a bit over-priced for a sheet mask but I loved the way it made my skin so smooth and radiant in an instant! Keep it half an arm’s length from the face, spritz and then wipe. Use it as often as required. No need to rinse. Now, this is truly one of its kind genius product! It has quickly occupied a permanent place in my hand bag. As much as I love travelling, I equally hate the dust and germs it brings along. No doubt, it’s my favourite product from the lot. It has totally changed and revolutionised my travel skincare for the better. Cleansing had always been an issue with me while travelling especially in situations where you don’t have access to water or don’t want to use public washrooms. 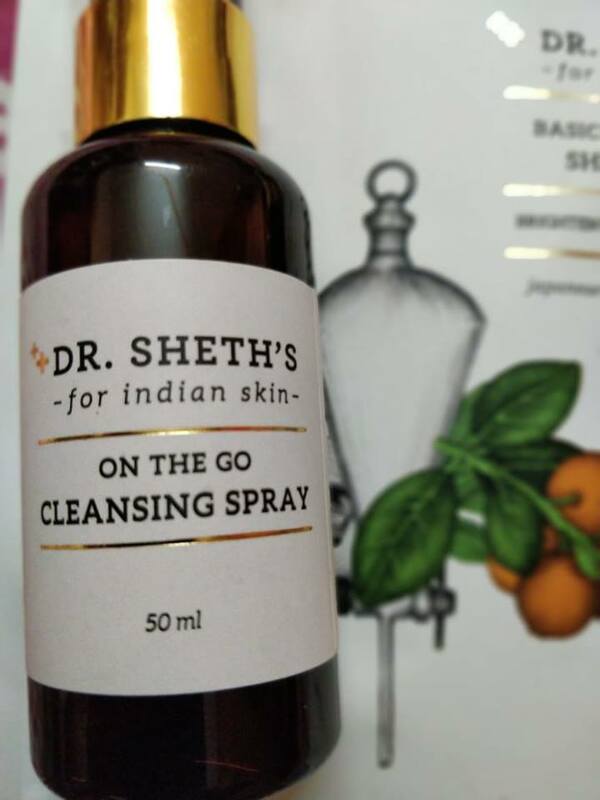 With Dr Sheth’s cleansing spray, all you got to do is just spray, wipe and put on your moisturizer/sunscreen/compact depending on the situation you’re in. So you have a clean canvas to work on even on-the-go – now isn’t this truly GENIUS? The only con I have found about this product is that it can sting your eyes. So be careful while spraying this product. Make sure your eyes are shut, when using this spray. Nice and detailed review. Hearing so many good reviews about this brand. Wish to try them, especially the cleansing spray.